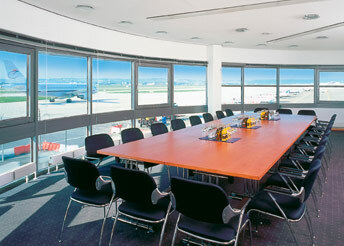 The General Aviation Terminal's (GAT) conference room is a highlight for every meeting. The participants sit in a semi-circle opening onto a unique view of Stuttgart's airport - just like in the control tower opposite. The room is semi-circular like a flight deck and has space for 40 guests. It is equipped with modern multimedia equipment for your presentations. Conference drinks and catering can be ordered or you can organise them yourselves: you do not need to order from us.